Dumneazu: Trout Fishing in Serbia. In Yiddish. Trout Fishing in Serbia. In Yiddish. I am a fly fisherman. I fish for trout. I am not always successful in the catching part, but the fishing for part I can handle very well. Trout fishing is not about going out and collecting fish meat for the table. You want trout for dinner, go to your local supermarket and pick up some farmed rainbow trout and grill them up! I prefer to let the wild trout be, and for the last fifty years or so most fly fishermen have adopted the practice of releasing their catch. Our trip to the Gradac river in Serbia with Claude Cahn and his lovely family was strictly a catch-and-release operation. The Gradac is home to a healthy wild strain of brown trout, with some grayling. Careful management of the fishery has made the river able to produce huge fish without resorting to tossing in stocked fish from hatcheries, and the purity of the water is such that the insect life that feed trout is extremely diverse and viable. We stayed with master fly tier Sasha Bencun who runs the Rokafly operation and guest lodge on the Gradac. Sasha maintains the river as well as drives the tiny four wheel drive jeep that negotiates the narrow donkey path down into the canyon. Why do I love fishing for trout? Because you catch trout in the most beautiful, wild places. 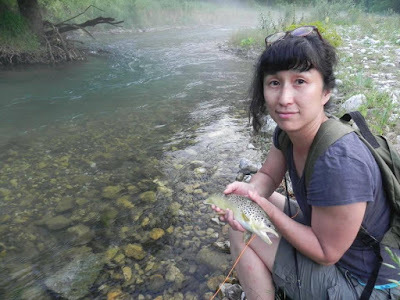 Fumie with a healthy Gradac brown trout. I began fishing at five years old - dunking worms for sunfish from a pier - and, like any kid, I hated worms. Worms are disgusting, especially the horrific looking sandworms we used for catching flounder off the Bronx. You may not realize it, but New York is full of fisherfolk. It is surrounded by water, and that means its surrounded by free food. My Dad and his friends were dedicated ocean fishermen, working class Jewish New Yorkers in pursuit of the wily flounder of Long Island Sound off of City Island and Orchard Beach. After the Great Migration from the Bronx to New Jersey I found myself in a Boy Scout troop that went on fishing trips to catch bass, perch and pickerel, classic New Jersey lake fish - on worms. Say what you will about impaling living slime tubes on hooks, worms always catch fish. The grownups, however, used fly rods and caught these beautiful torpedo shaped trout, a fish that I knew only from outdoor magazines, and then they would stand around saying adult things like "Hey! Will ya look at those speckled beauties." Soon I got mixed up in the excitement of catching fish without having to vivisect worms! 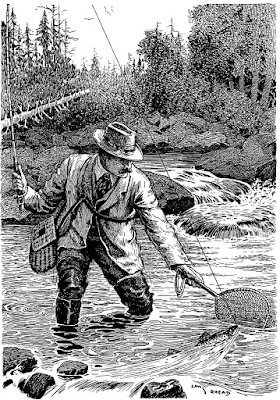 Most of what I knew about fly fishing came from outdoor writers born in the early 20th century, like Ray Bergman, who fished wild brook trout in natural waters a few miles outside of New York City and used tackle that predated fiberglass rods and nylon lines. I'm still a luddite when it comes to tackle. I like to keep it simple and cheap. I used to throw huge size 6 Mickey Finn streamers and wet flies at the trout and - of course - never caught a one. 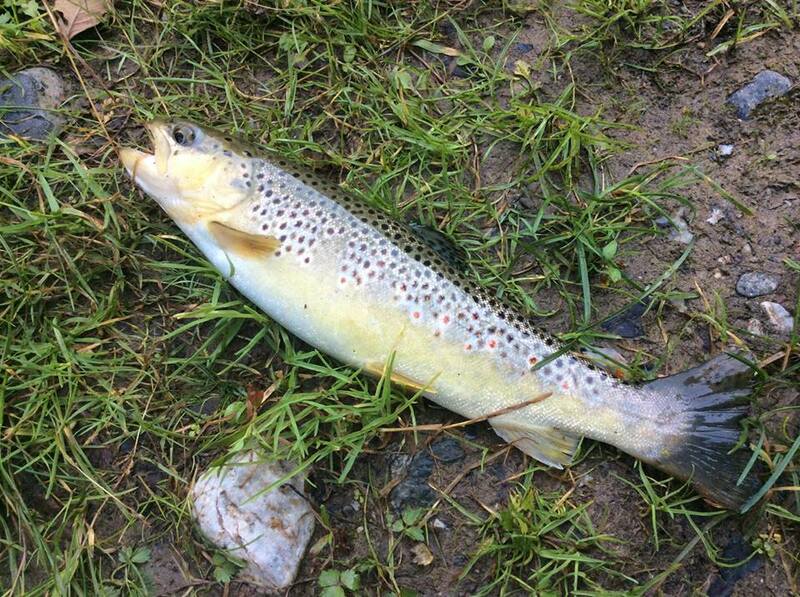 It wasn't until I was in my twenties that I actually caught a trout on a fly. Once that happened, I was, ahem, hooked. I learned to tie flies (I couldn't afford to buy them) When I moved to Europe I was able to suppress the urge to catch trout for a few years, but once, while on a weekend Sixtus Kapolna pub retreat with Claude Cahn in North Hungary, we decided to (illegally) fish one of the few Hungarian streams reputed to hold trout. It did. We got away with the crime - this is Hungary, after all, and crime is legal - and since then we have been combing East Europe and Balkans looking for trout, and mucking through the sometimes arcane bureaucracy of getting a fishing permit in order to do it legally. We fished Slovakia a lot until Claude's job posted him in Serbia and he discovered Rokafly and the Gradac. Removing a fish from the water before releasing it is actually a very bad idea. And so we found ourselves in western Serbia last week, at the bottom of a deep canyon knee deep in cold, clear water, casting fly lines at wild brown trout the size of my leg, locked in a complex duel of wits and skill with simple vertebrates whose brains are the size of a lentil. (Trout fishing resembles politics in this aspect.) We wrote last September about visiting Valjevo, where Sasha Bencun runs the Rokafly fishing lodge. Back then fishing was slower: late season always is. This year Claude - known in Talmudic circles as the Maimonides of the Dry Fly - booked Sasha's guest house for June, prime time for trout. We arrived at the tail end of summer's first heat wave, but the canyon shaded the river and the fish were still active. Maimonides with a heavy Gradac Brown Trout. The Gradac is said to be one of Europe's cleanest rivers, and the trout are wild brown trout that breed in the steam - no stocked rainbows here. There are Grayling as well - not as many as in the past, since comorants - fish eating ducks - have invaded the interior of Serbia. I do not like comorants: they have pretty much ruined the fishing on my favorite Slovak stream, the Revuca. The grayling are always their first victims. Grayling have mouths on the bottom of their heads, so they don't notice dangers from above, as the trout do who feed at all stream levels. They are also somewhat less skittish than trout and tend to form schools in shallow water, making these little goobers easy prey for dive bombing ducks, which can eat two kilos of fish in a day. So no, we did not eat any of these fish. Instead, Sasha's wife Biljana cooked up some of the best farm-fresh Serbian food imaginable: our first day lunch was a platter of grilled meats, cevapcici, chicken, and cutlets, pickled red peppers, clotted cream kaymak, cheese, salad, and fresh loaves of somun bread. Nobody would want to eat a fish instead of a Serbian grill feast. Sure it isn't everyday you see two Jewish guys out fly fishing. (In Serbia this is even more rare.) Traditionally, fly fishing is a sport of the gentile elite, of English gents and Wall Street bankers, of Wyoming ranchers, guys who answer to names like Chip, and Wiley. That's what I love about fishing in the Balkans: nobody cares that the cast of Fiddler on the Roof is double hauling dry flies to the mayfly hatch at 7 AM. I don't wear much identifiable fishing gear: no waders, no fancy vest, just a baseball cap from Katz's deli. I talk to the fish in Yiddish: kim zhe arayn, reb fishl! nokh a bisl mer, reb fishl! Claude, however, is a Yekke and speaks perfect High German. He looks like the Orvis fishing company took out an advertisement in Der Sturmer. 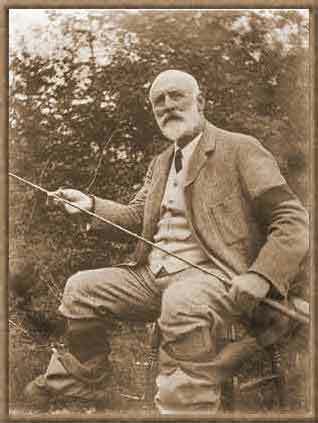 And yet, the 19th century father of genteel British dry fly fishing, Frederic M. Halford, was Jewish. According to no less of an authority that Wikipedia, "Frederic Halford, whose first book,Floating Flies and How to Dress Them, was published in 1886 and took the upper-crust world of British fly-fishing by storm...Halford was born Frederic Michael Hyam into a wealthy Jewish family of German ancestry in 1844 in Birmingham, England." Halford established the English obsession with using dry flies exclusively, and corresponded with the American outdoor writer and fisherman Theodore Gordon who imported the idea - and the flies - to the Catskill Mountains a few hours north of New York City. The Catskills region has since juggled two influential cultures: the gentleman fishermen who pursue trout in streams like the Nevesink and Delaware, and the millions of New York Jews who went to spend their summers in hotels and bungalow colonies. To this day, there are Hasidic summer colonies throughout the region. If a Jew is involved with trout fishing, it probably started in the Catskills. Our family friend, Frank Plotnik, a Warsaw Ghetto partisan veteran , taught me about bass fishing in the Catskills on vacations at the Tamarack Lodge - including the information that fish speak Yiddish. Trout are not, however, the most Jewish of fish. A Jewish fish is something you can haggle for in a fish market, something you can take home alive and keep in a bathtub until the time comes to kill, cook, and eat. Carp is a Jewish fish. Pike is a Jewish fish. The entire genus of overgrown bony minnows called "whitefish" are Jewish fish. Basically, if something is a beautiful sport fish that you can eat freshly filleted, it is not a Jewish fish. 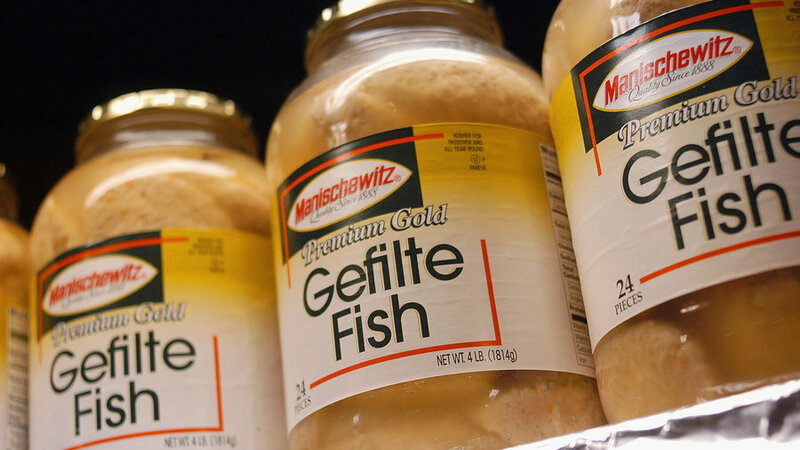 A Jewish fish is a bony, fatty fish gets chopped and denatured and extended with bread or matzoh, formed into gelatinous balls. and stuffed back into the fish skin, a practice still observed in East Europe and Turkey. The "stuffing" lends the fish its name: gefilte fish. Nowadays we more modern Jews leave out the re-stuffing of the fish skin and just eat the stuff from jars. The Memorial to Reb Fishl. The Talmud doesn't require any special ceremony or incantations when you dispatch a Jewish fish - just whack it on the head and begin the process of boiling, chopping, and deflavoring. The reason is that cows, sheep, or poultry are animals that live on land - and they require a shekhter - a kosher slaughter - to purify them of the baser elements that go with things that live on earth (such as Fox News, Domino's Pizza, Ebola virus, and Senator Paul Ryan.) Fish, living in purer water, merely need to be "gathered." No blessing, no pricey rabbinical presence, just scale 'em, fry 'em, and you are good to go. Beautiful! Very nice looking place. I am Serbian and didn't know about the fly fishing here. Have to admit though, the grilled meat platter looked awesome. Hope you had a great time. I don't know about Jewish anglers, but on the Thames there are now notices in Polish that forbid fishermen from removing fish after catching! (I suppose news has got out that Poles and other east European migrants enjoy pike and other river fish.